One of the things that I was really looking forward to on our trip to Scotland, was to try some delicious breakfast food! 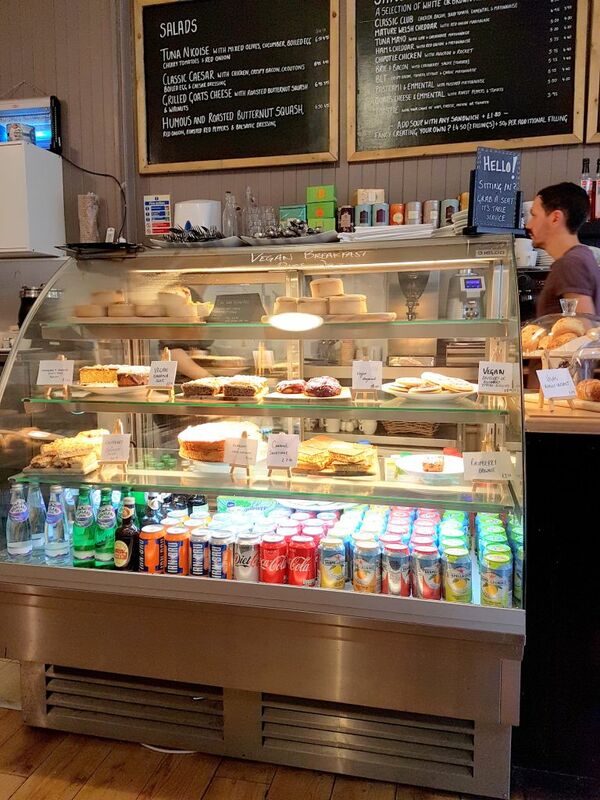 Having breakfast out is a treat we usually keep to holidays and special occasions, so what better way to enjoy something delicious than on holiday in Glasgow. I’d read a lot about Rose and Grants and how vegan friendly they are, so had to make sure they were on our to visit list. We visited Rose and Grants 3 times over the 5 days we were in Glasgow, and we could have gone more! Yep. You read it. When we got to Glasgow, it was actually one of the first places we visited, complete with our wheely hand luggage cases. It was also one of the last places we visited before we left! What’s all the fuss about Rose and Grants? Rose and Grants is best described as a cafe/eaterie/coffee shop. However, it’s far from a greasy spoon – in terms of appearance, anyway. Rose and Grants city centre branch feeds the many workers and tourists in Glasgow city centre, particularly in Merchant City, which is where it’s found. They offer a wide range of food options, including those for vegan and/or gluten free diets. 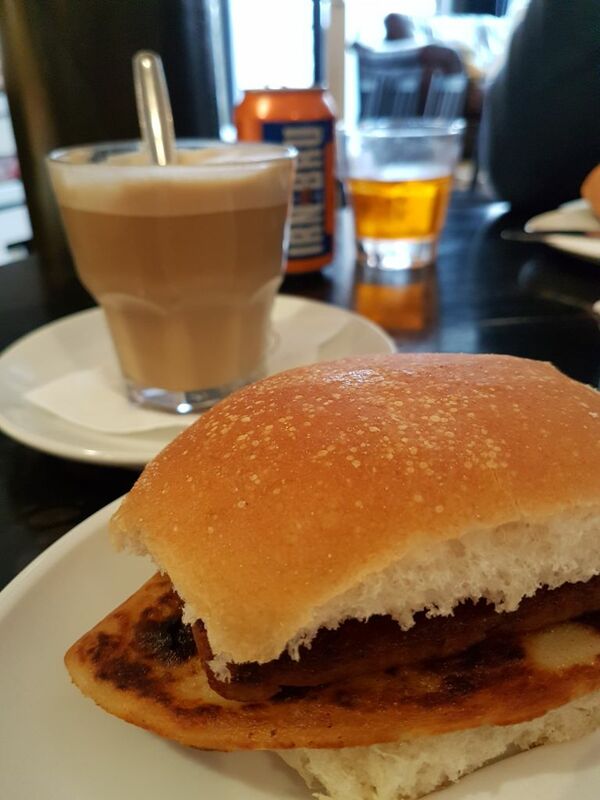 They are known for their square sausage, but also their VEGAN square sausage! Yep, you’ve read it right – VEGAN SQUARE SAUSAGE. 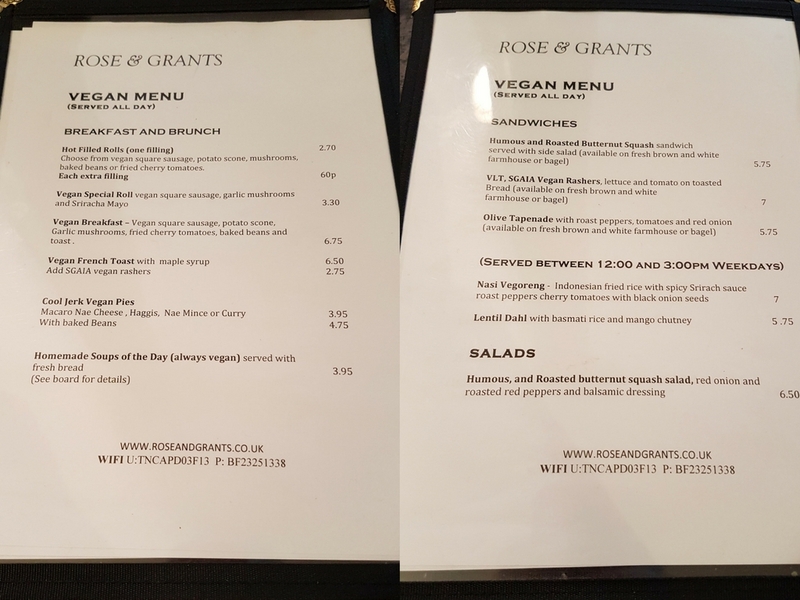 As you can see from the vegan menu, there’s loads of vegan options at Rose and Grants. In addition to this, there are also vegan cakes, pastries, and delicious chocolate bars from Vegan Burd. So let’s get back to that vegan square sausage, shall we? One of the things I had my mind set on was trying the vegan square sausage. 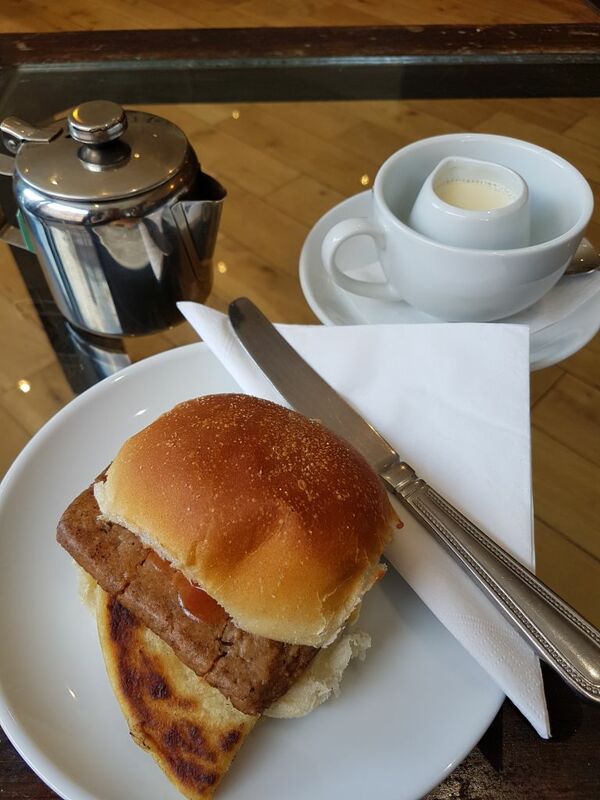 When we got there on the day we arrived, I ordered the breakfast roll with vegan square sausage and potato scone. Oh, and of course I added a little bit of ketchup. And what did I think? Well, the roll didn’t last long. And it wasn’t because I was super hungry (as mentioned in my Bread Meats Bread review, I really struggle with my appetite when travelling), just because it was so, so good! This really perked me up after travelling, alongside the soy latte I also ordered… let’s just say it was really needed! I ate breakfast rolls 2 of the 3 times we visited Rose and Grants, and on our final day I enjoyed a delicious vegan French toast. 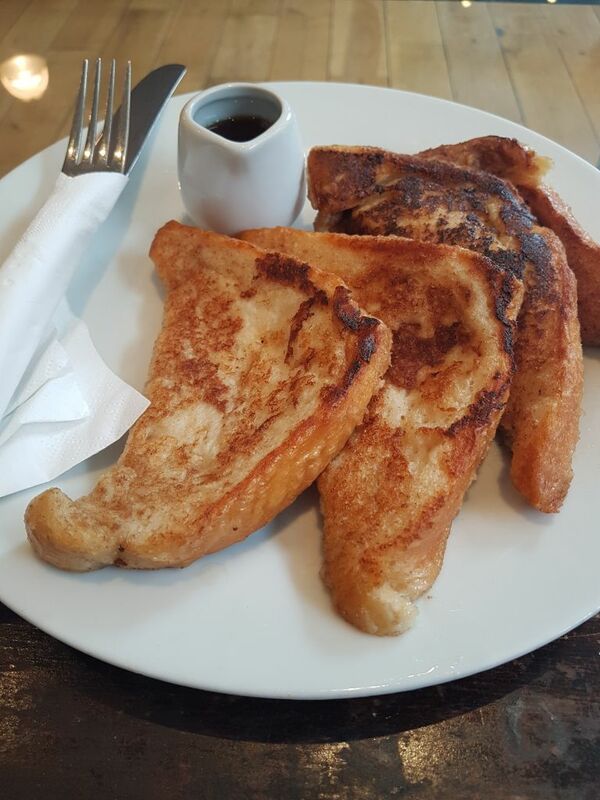 Oh my goodness – I’ve not had French toast since I went vegan and this was the best way to break myself back into it. I’m actually now craving it just writing this! 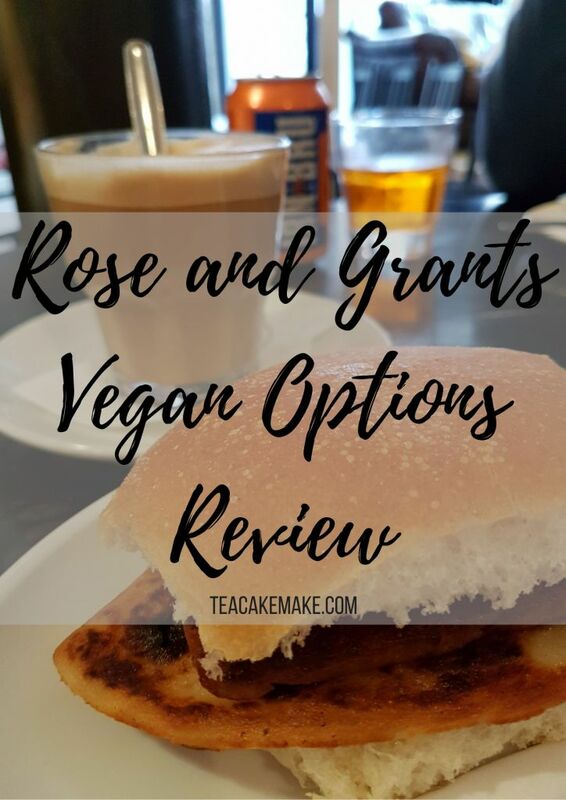 There are loads of other things to try on the Rose and Grants vegan menu – on my to try list for our next visit to Glasgow (of course we need to return!) are the CoolJerk vegan pies; particularly the haggis one! There’s also other hot dishes available, such as vegan Nasi Goreng, and soup of the day (which is always vegan and gluten free). 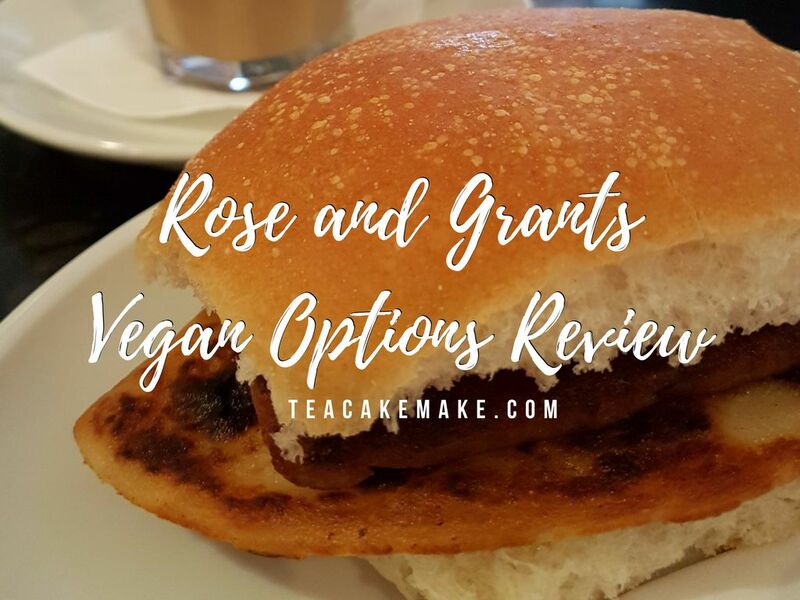 Rose and Grants really is a great place for coffee and something to eat, whether you’re vegan or not! Next time you’re in Glasgow, make sure to give them a visit. They have 2 locations – Merchant City (27 Trongate) in the centre of Glasgow, and in Bearsden, which is to the north west of Glasgow. Have you been to Rose and Grants before? What did you have when you visited, and what did you think of it? Let me know in the comments below! I saw that! But I didn’t try as I didn’t fancy it at the time!